If you’re considering jumping in to the interesting world of beekeeping, you’re going to need the proper equipment. This will of course include a suitable bee keeping suit. Well you’ve come to the right place. In this article we have pulled together all that you need to know when buying a bee suit. We’ve reviewed 5 of the best currently on the market and updated our findings for 2019 (for the results just head to the table below). There’s also a comprehensive bee suit buyer’s guide and a lot more information besides. Bee suits do not come cheap, so it’s best to have completed your research before ordering. This is where our review section will hopefully lend a helping hand. We’ve taken 5 of the leading products below to give you an in depth look into what is available and what you should possibly opt for. We want to make sure you can safely enjoy your beekeeping, without getting stung. The first on our list is a product that seeks to offer good ventilation (something that’s often difficult whilst ensuring the requisite protection) in comparison to other suits. The suit is meant to be a top-of-the-line product that includes all the extra storage and extra room the professional would want and has been advertised as being a fool-proof guard for someone who’s at their hive a lot, more often than not to do professional-grade work. Ultra Breeze is a second-generation company; their product lines are made entirely in the USA. They produce suits that try to build a better suit design, (such as the in built tools pockets) with the aim of maintaining protection while promoting breath-ability. Breathability, by the way, if you’re a newcomer, quite simply cannot be overlooked when one is considering taking up a hobby/profession that’s mostly spent in a heavy suit while it’s the middle of summer. The Ultrabreeze has become a bit of a trusted name with regard to protection, with nary an individual saying anything save the bees just bounce right off’. It’s made to be used in summer, with great attention put into how well it breathes in hot weather. The next suit on our list represents more budget friendly product, but still seeks to offer good levels of protection, some bells and whistles and reasonable ventilation. It uses several layers of polyester blended fabrics and comes with a self-supporting visored hood (so you can see where you’re going). Humble Bee is a rather new addition to the beekeeping universe, only debuting a few years back. It’s a European make (Luxembourg) that takes beekeeping and bee caring seriously, however, donating 10% of profits to the protection of bees worldwide. The suit actually isn’t bad for a mid-grade suit and outperforms its price tag with regard to protection – many of those customer reviews related to the product state that they’ve never been stung. However, it’s also necessary not to skimp on some of the things that matter most, especially from a closure standpoint. The plastic zippers were a real drawback for first-time users, with many citing examples of breakage. One could imagine this a common occurrence with long zippers that go from head to toe. Further, as another primary facet of beekeeping is typically bending down to pick up a hive etc, the fact remains that the undersized led to more than a few complaints. This suit seeks to fill the gap left from mid-grade suits that don’t stand up to professional beekeeping. It’s a full-body suit with several tech add-ons, such as material designed not to shift/roll up whilst moving around the hive. The fixable strap goes across the face and is meant to lend another layer of protection. Aspectek is a bit of an all-arounder as far as home and garden tools go, and doesn’t seek to specialize in bee suits. This would lead one to believe that its suit is destined for the entry-level beginner, though this remains to be seen. The cotton material – while breathable – has been cited as not necessarily protecting from all strings. This was a difficult one to review, as you can’t ignore the price in comparison to some of the higher-end models. The suit was lauded as keeping most stingers away but seemed to be the natural companion of the weekend warrior who goes off after a nest of yellowjackets than after the regular day-to-day maintenance of their own hive. This could be expected by a company that doesn’t specialize in beekeeping products. All in all: you get what you pay for; in this case, it seems to be worth it (just). The Natural Apiary really focuses on using old-school materials to provide both protection and comfort. It advertises not skimping on the cotton, provision of extra seals and quality zippers, a thick collar and various colors (including camouflage no less) to ensure the bees don’t get overly excited when you’re around. The arm and leg bands are adjustable elastic, allegedly creating an extra seal to prevent unwanted intrusion by the little critters. Natural Apiary has been around for a bit and focuses solely on beekeeping products, not just necessarily bee suits. They don’t claim to give vent to all your beekeeping needs, but do sell hives, beeswax, gloves, smoke etc. One would expect them to know a bit about what makes a good bee suit. As there quite simply hasn’t been a bad review of the suit, the only thing one could point out as being negative is being the marketing and price content. Pretty much the best of the bunch, the suit is the sole contender that actually does everything it says it’s going to do. It offers protection, breathability, and comfort, this while giving the user the size he or she has been looking for. It’s easily cleaned, and quite light as well. The price is a bit steep, yes, but it looks like the suit is most likely the last one you’re going to buy. As one could guess from the nomenclature, this suit is meant to bring the budding enthusiast safely into the beekeeping fold, this without too many strings along the way. The suit, however, does boast some attributes that more professional suits list as bonuses: heavy-duty zippers, adjustable sleeves, elastic thumb hold and a self-supporting veil are included in the combo. It’s a blended material – 60 percent cotton to 40 percent polyester – so there’s a reasonable amount of breathability if they got the design right. MANN LAKE has actually been in business for quite some time, and offer a variety of suits, as well as numerous…well, anything to do with beekeeping. They’re a Minnesota, USA brand that specializes in everything aviary. The suit pretty much represents nearly-perfect marketing, save for a price tag that’s perhaps a bit steep. Most of the users loved the material – though stating it did get hot on occasion – though there were some concerns about the level protection. With the upgrade, you’re most likely going to get that second layer you’ve been dreaming of. Further, the oversized aspect of the suit, as well as a lack of in-between sizing led to some users basically have the middle of the suit near their knees. However, most cited the suit was good value for the money. 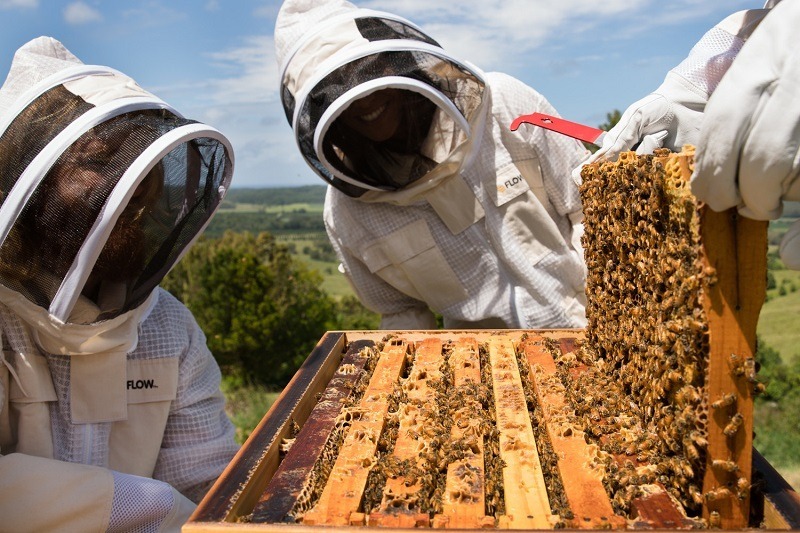 If you’re a planning to start up either a business or hobby beekeeping, you will be in the process of purchasing all the gear you need to get started. High on the list of ‘must-have’ equipment is the bee suit. In this buyer’s guide we will take a look at why you need a bee suit, the different types you can buy, and what to look for when you start shopping for one. While the answer to this may well seem obvious, there are actually a number of reasons to wear a bee suit. Anyone wishing to take the past time seriously, will need a suit before they begin. Let’s take a closer look at why the bee suit should be purchased before you even look into buying the hive. The art of beekeeping involves manipulating a hive of bees in order to harvest honey. It is a simple law of nature that when a beekeeper disturbs the hive, the bees will react. You only need place yourself in their position to understand why; if someone came into your home turning everything upside down, you would be confused and will act to make it stop. The bees sometimes become aggressive and if you are not wearing a protective suit, you will get stung. While just one bee sting will be annoying, receiving a number of stings all at the same time could lead to a speedy trip to the hospital. You will want to avoid this at all costs. If you are one of the unfortunate people that react badly to bee stings due to allergies, a reliable bee suit that can prevent all stings could be a matter of life and death. Although, one must question why anyone with a serious bee allergy would decide to be in such close contact with them. Honey bees die after stinging and their stinger can remain in your skin. By making it impossible for them to make contact with you, you are actually saving their lives. If you keep bees as part of a business, there will be regulations that you must abide by. Having suitable protective clothing for you and your employees will be an important part of that. Furthermore, for anyone that does bee keeping for a living, the bee keeper suit is their uniform. It basically comes with the territory. So we’ve established that a bee suit is a necessity when it comes to beekeeping. However, taking the subject further when it comes to buying a bee suit you need to decide what kind will best meet your needs. Some professionals prefer the non-complete solution. This could be in the form of a half suit, or maybe just head protection with gloves, (more on these below). A true beginner should always opt for the full suit. When you are starting out, you will naturally be more wary. It is also likely that the bees will not be so used to being disturbed. You will take longer when you first start working with the hive, and you will be in a vulnerable position. The full suit is therefore highly recommended. All the same, let’s take a closer look at the difference between these two main styles of bee suit. The half bee suit consist of the hat to protect the head, the veil to protect the face (and enable you to see) and a jacket. Beneath all of this, you should wear long clothing that covers the skin and cannot be compromised by an angry bee. Gloves and boots designed for beekeeping will also be worn. As the name would suggest, the full bee suit is an all in one affair that covers the entire body. They are designed in a way so that no entry point exists for the wandering bee. They can be worn over your normal clothing, however ventilation is key. A poorly made full bee suit will leave the wearer sweating and extremely uncomfortable. Beekeeping boots and gloves will also be worn. There are clearly a number of issues you need to consider when buying a bee suit. You should certainly aim for the best quality suit you can afford. One should not put a price on comfort (or at least scrimp in the pursuit of it). With that being said, let’s take a closer look at the most important factors that go towards a suit worth buying. We mentioned comfort in the little introduction above. Beyond the comfort of not being stung, you will want your suit to offer good temperature regulation. You will mostly be using the suit in the summer months, the last thing you will want is to be confined within protective clothing that makes you sweat. Aerated suits are best for this. You can also find full suits that use lightweight materials. Half suits are also generally cooler to wear (hence many professionals opting for the half suit over time). The best and most popular color used for bee suits is white. This helps both with temperature regulation, (it reflects the heat away which helps keep the inside of the suit cooler), as well as keeping the bees at bay. Bees are naturally repelled by the color white, which helps keep them a little further away while you tend to the hive. All manner of materials are used in the manufacture of bee suits. One of the most common are poly cotton bee jackets that feature foam panels and mesh for increased aeration. You will also find synthetic fabric suits that utilise 3D layer designs to prevent the stinger from penetrating the fabric. Which ever suit you opt for, be sure to read the reviews and customer comments before hand. If the suit is well designed with good quality materials, it will fulfil the most important two tasks; proper sting prevention with a high level of ventilation. It is recommended that you buy a suit that comes fitted with a veil (it is possible to buy these components separately, however you risk compatibility issues with the veil not fitting properly). The rounded veil is a good option because it keeps the bees farther away from the face. You can also buy collapsible or fencing veils. Again, which ever you go for, fit and finish are very important. You want a robust, lightweight veil that keeps the bees out, while not compromising your vision. Finally, you should opt for a suit with quality zippers and elastic around the wrist, ankles, and waist. This will help keep you ‘air-tight’ so to speak. These entry points need to be closed off from wandering, angry bees. Low quality fitting here could man that your suit rides up on the leg and ankles, and could become a potential doorway to an uninvited guest. And so, there you have it. A reasonable array of suits to give you an idea of what you should be looking for, no matter what your level or budget. When looking for a suit, consider how often you’re going to be using it, as well as some of the downsides of different products – heavier materials tend not to wear as well in the long term, for instance. Also – do some research to see how the product is sized, as this varies considerably depending on brand. Keep safe, and take your time before purchasing.